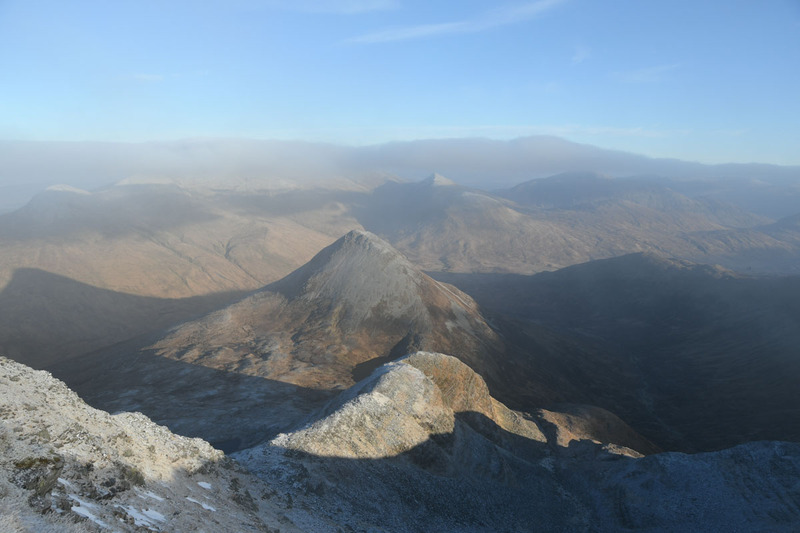 Binnein Mor and Na Gruagaichean, a forecast off the mark. 2nd January 2019. 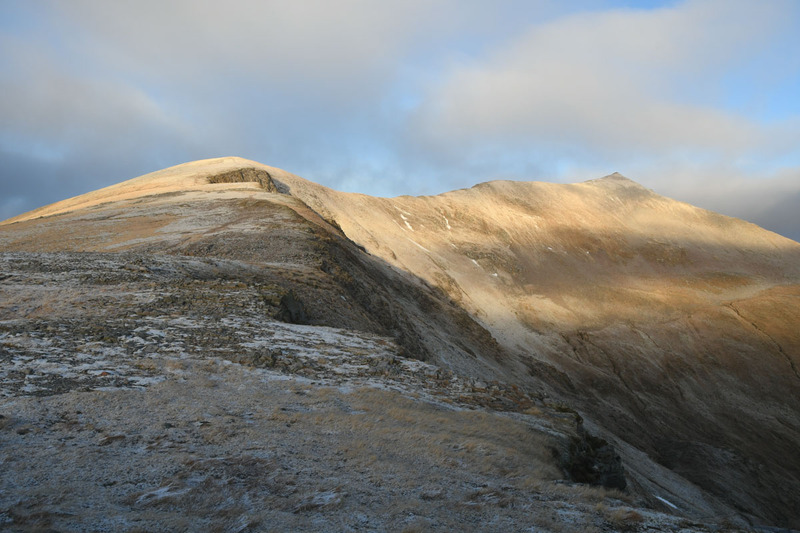 A cracking looking forecast on offer for the 2nd of January – 80% cloud free munros and extensive sunshine on MWIS, Met Office and BBC seemed to concur. We decided on a dark start to head up Binnein Mor from Kinlochleven. 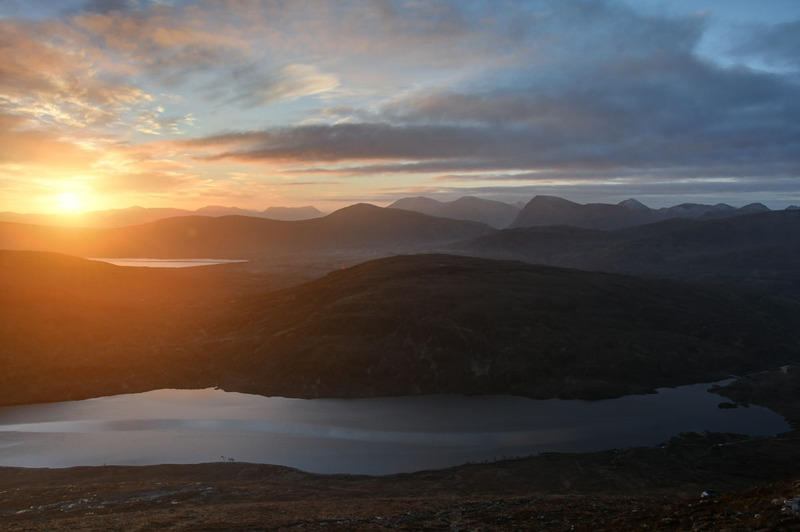 Kicked off from the bottom of the Mamores Lodge road at 0645 – over 2 hours til dawn. Only a thin crescent moon up so head torches were needed for the first 50 minutes or so. I do like walking through the developing dawn, it’s great to see the light building through first light until the sun breaks the horizon. There’s fast progress to be made out the road to Loch Eilde Mor. The path up to Coire an Lochain, between Sgurr Eilde Beag and Sgurr Eilde Mor is of good quality too. 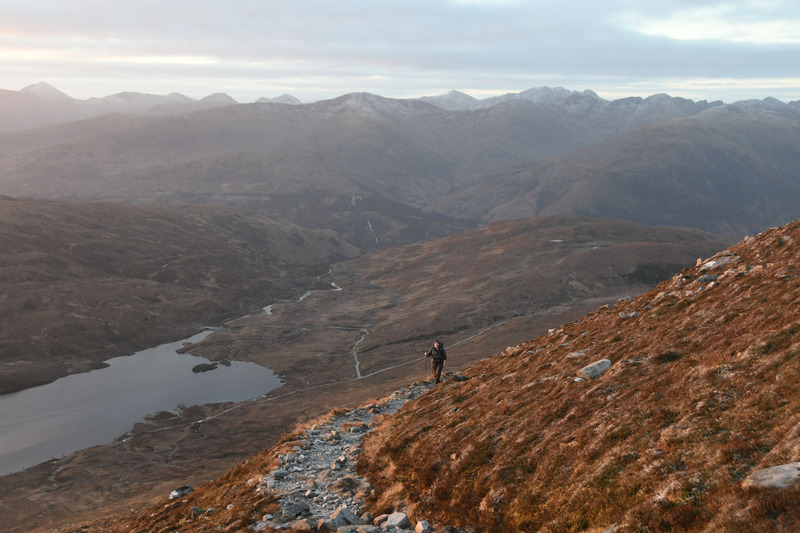 We were ascending towards Coire an Lochain by the time dawn was building to sunrise. I’d taken the ice axes just in case, although I knew from recent pictures that they would probably be merely decorative. By the time we could see the hill tops it was obvious that they would not be in hand for the day. 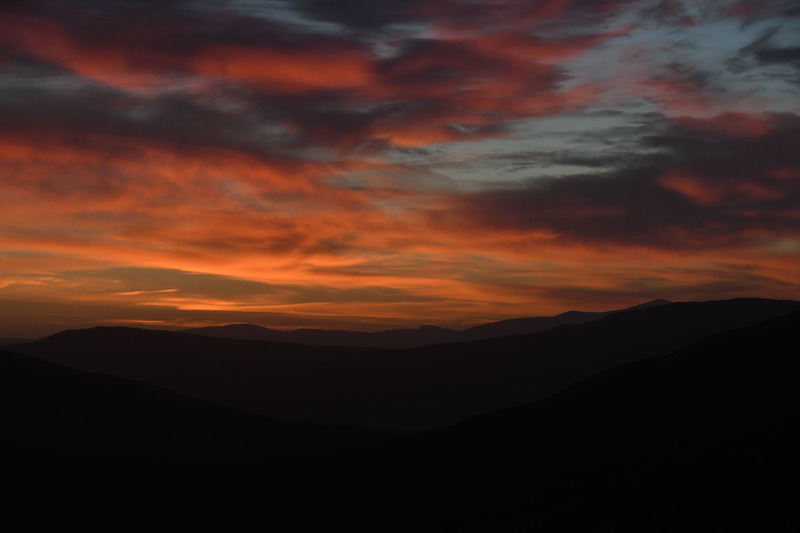 There’s a good feeling as the sun breaches the horizon – not quite as good as after an overnight camp, but still nice. A little troubling that to the S there was quite a significant amount of cloud, Glen Coe looked rather grey. Still, a nice sunrise is not to be sniffed at, and hopefully the clouds would roll away. 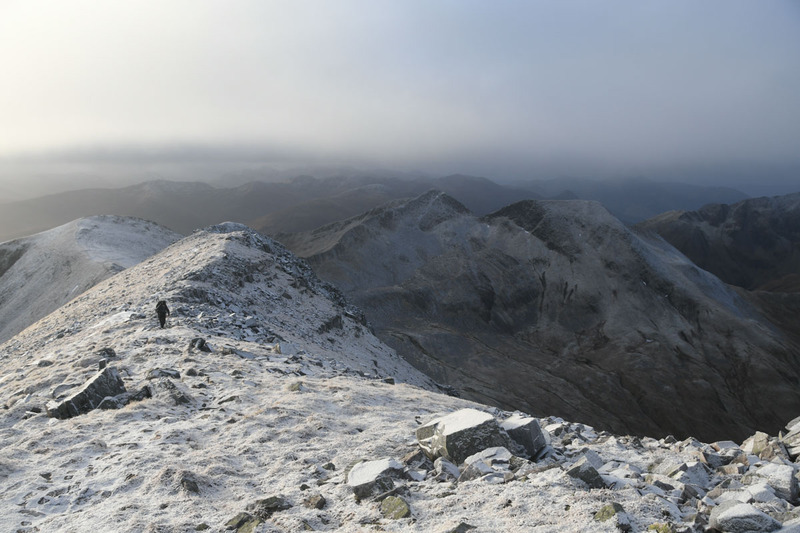 The variability of Scottish hillwalking – back in October this was a wintry wonderland, in January it looks autumnal! 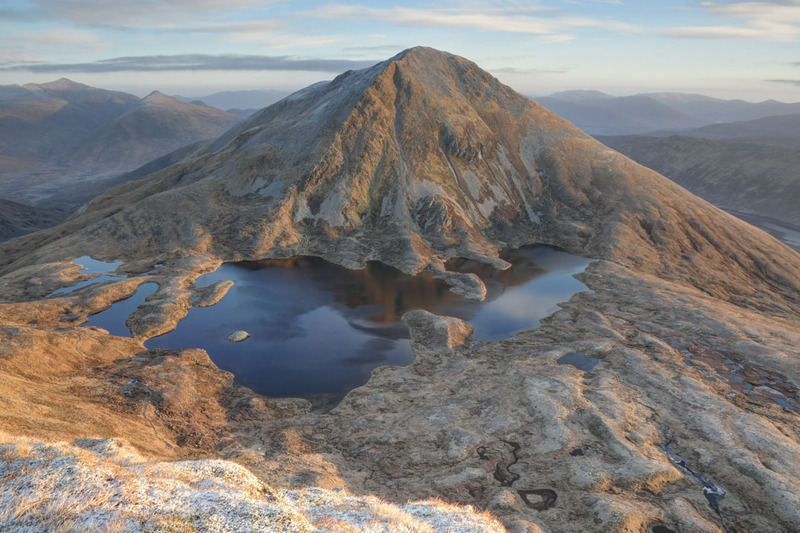 There’s a fabulous stalkers path ascending Sgurr Eilde Beag – an old favourite revisited after 13 years. It seems easy ascending up to 950m. 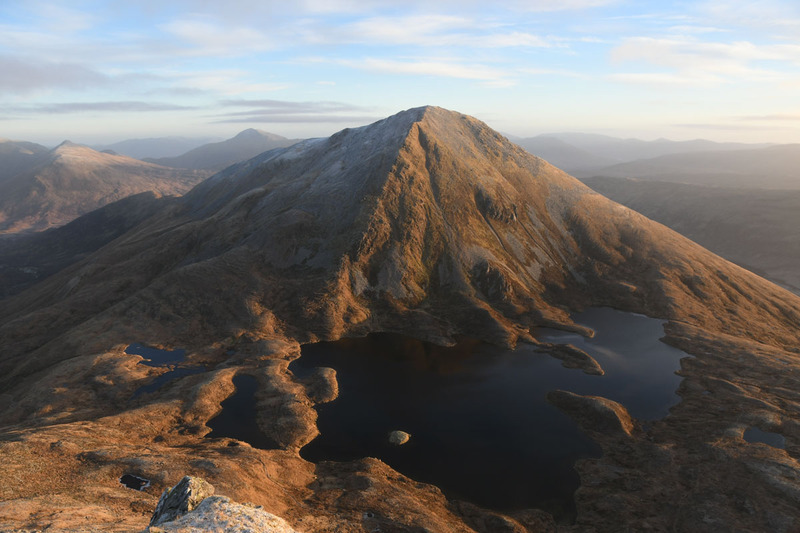 Views develop of Binnein Mor and Na Gruagaichean. 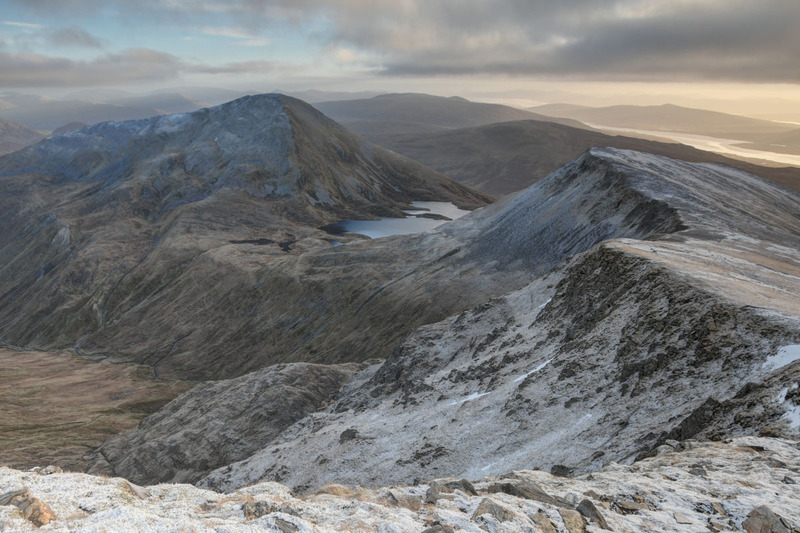 The view down to Coire an Lochain and Sgurr Eilde Mor is a cracker. 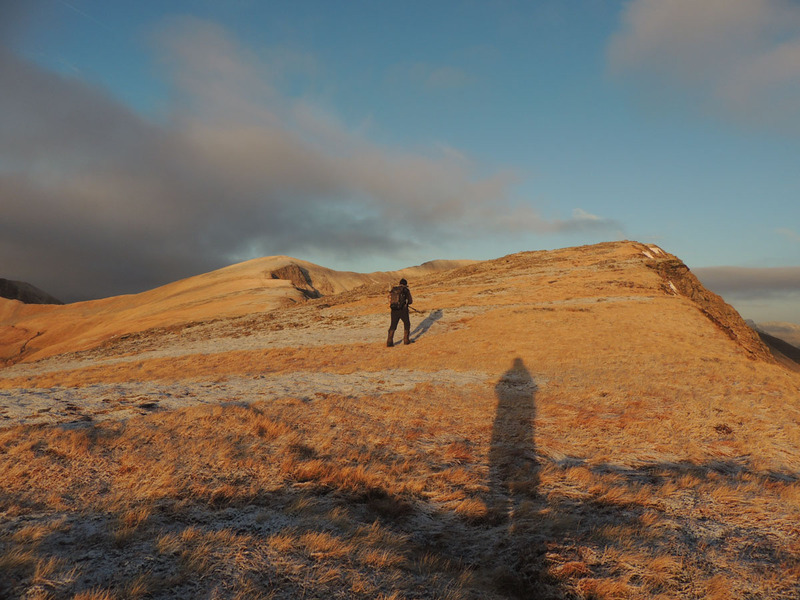 The light was lovely, well worth an early start – having the hills to yourself for a little while is a bonus. 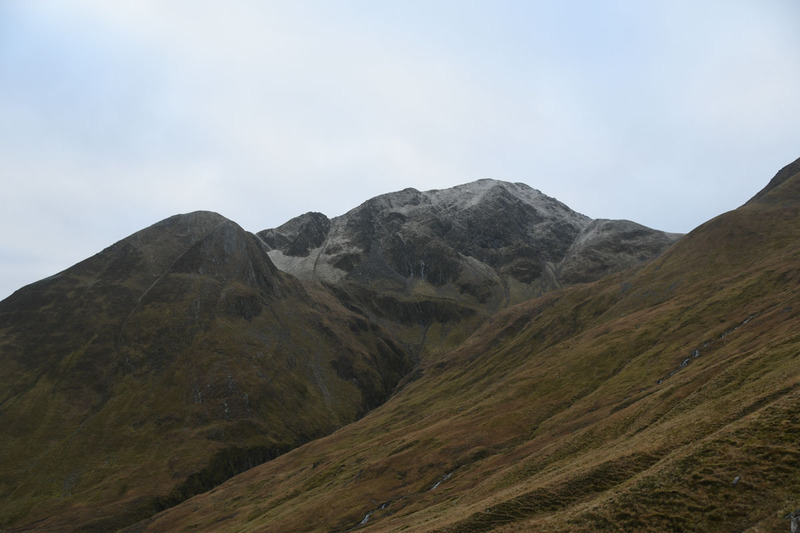 Up to Sgurr Eilde Beag and added some layers – the forecast 10mph wind felt a bit stiffer and was rather biting. Good views though. 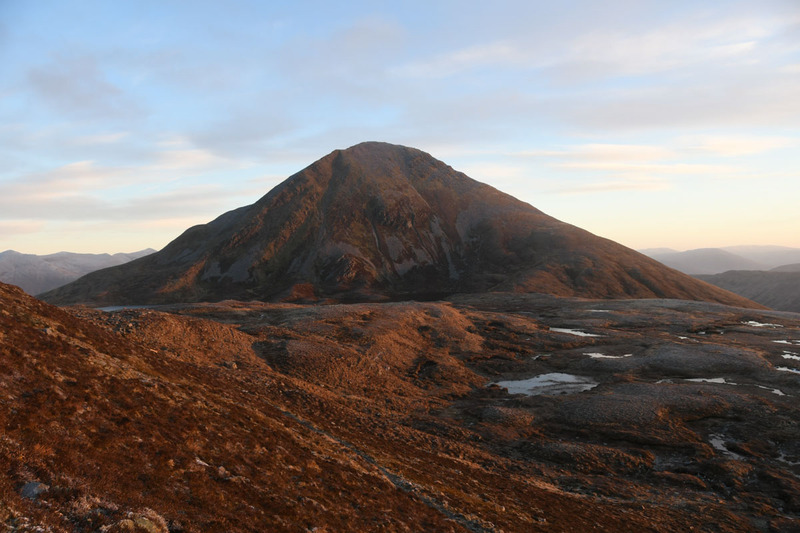 Most of the work is done by the time Sgurr Eilde Beag is achieved – from here it’s gentle slopes up and across to Binnein Mor. 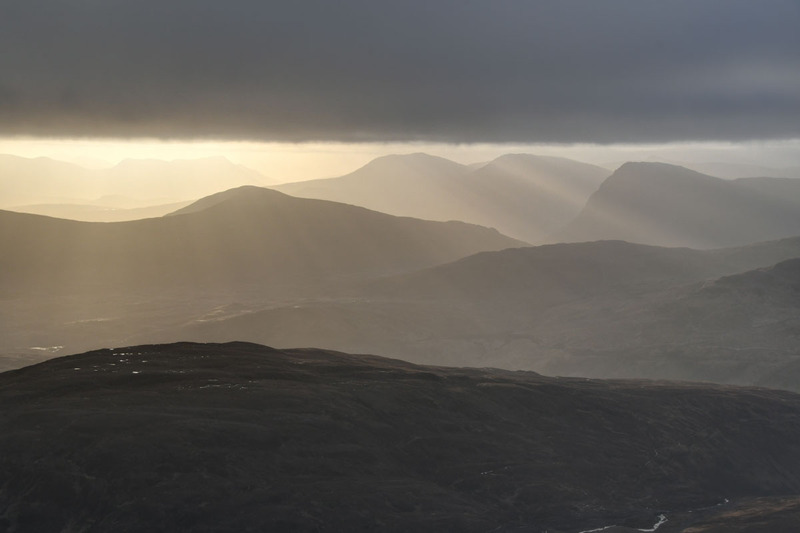 The clouds to the south were not breaking, Glen Coe was looking rather monochrome. The sun was swing round to south and the clouds were moving east, our sunshine was diminishing. Atmospheric though. 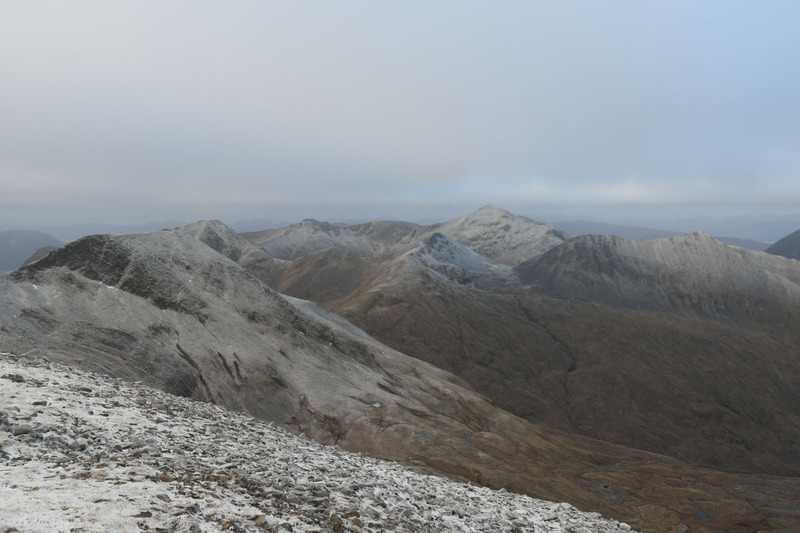 To the west the remainder of the Mamores and beyond were sunless. The sun was in hiding with sunbeams mocking us. 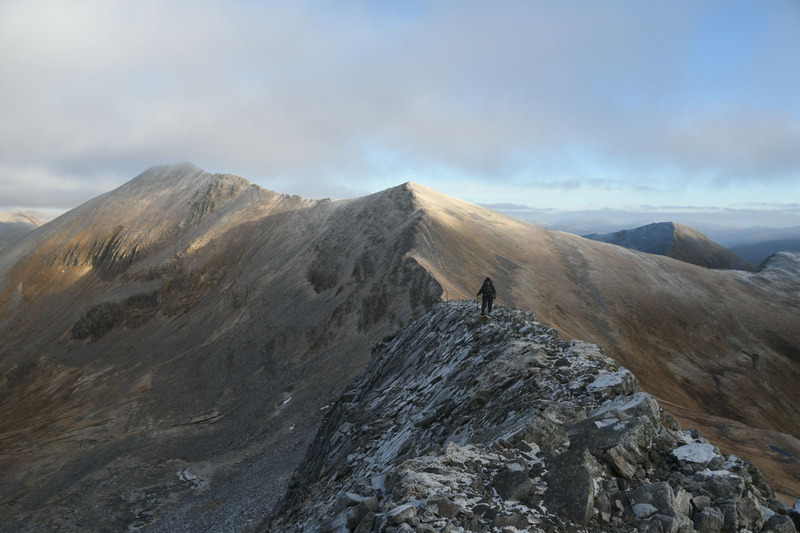 Still, it’s a nice wee ridge out to Binnein Mor. 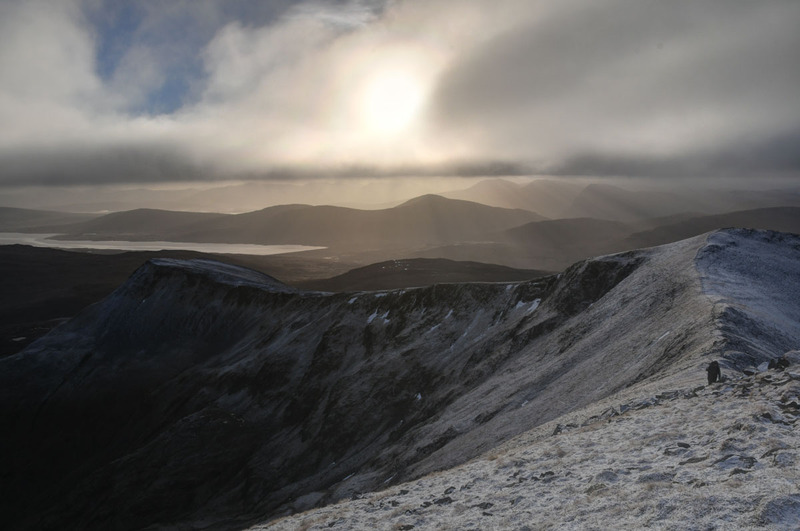 Hoar frost and a light dusting of snow were icing the last of the approach to Binnein Mor. 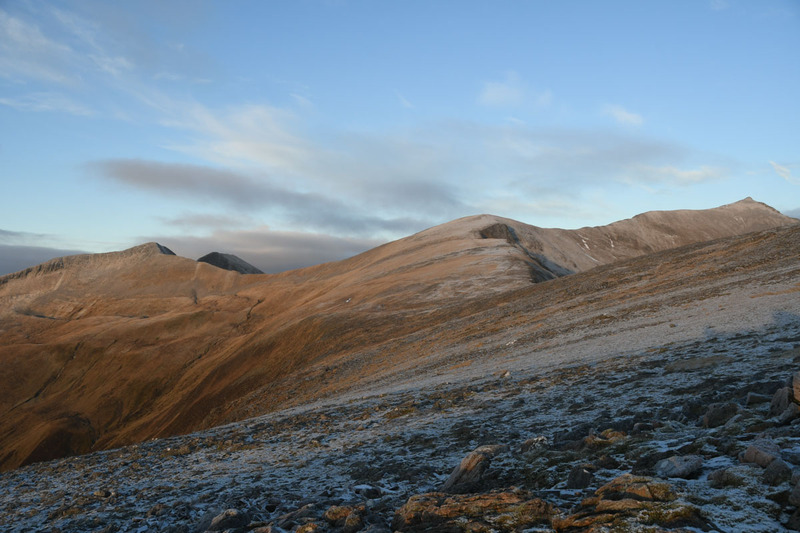 A Golden Eagle sailed by from the north side of Binnein Mor out towards Sgurr Eilde Mor. Quickly disappearing from view. The summit of Binnein Mor was actually just in the cloud layer, we sat down and had some lunch as the cloud came and went. 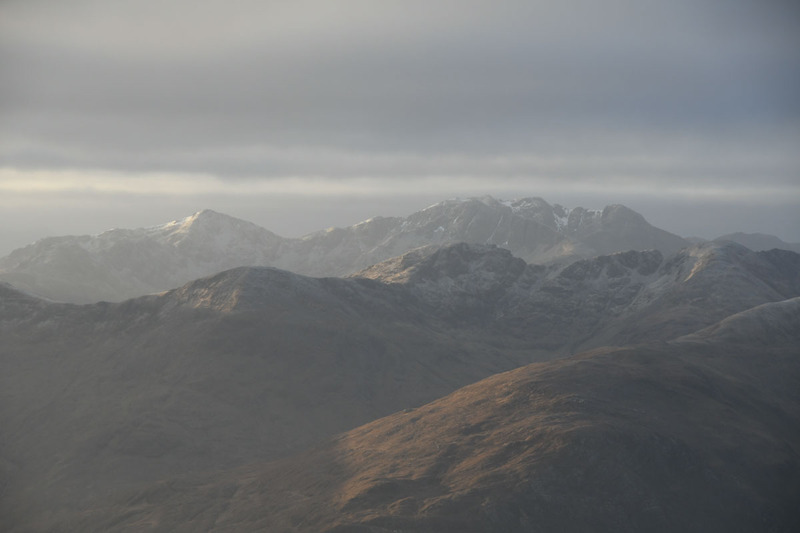 To our east there was still some direct sunshine, occasionally it was clear enough to see Binnein Beag and Stob Ban. 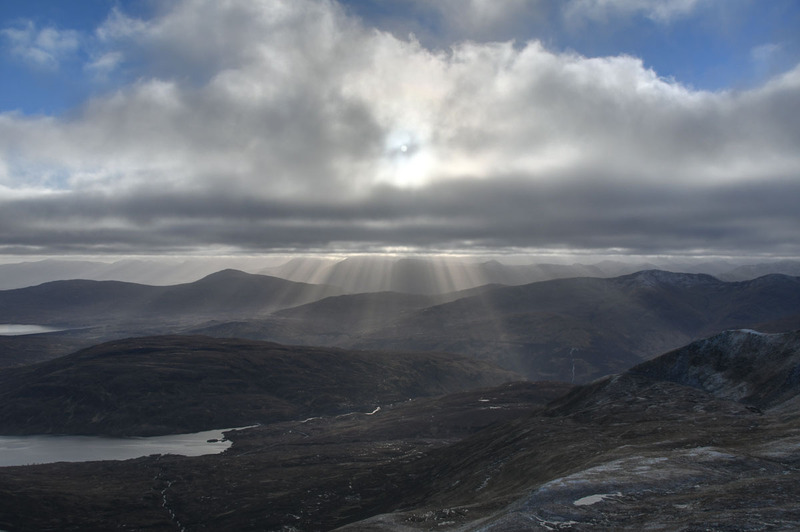 Headed back to the 1062m point with sunbeams triangulating the sun’s position behind the cloud. 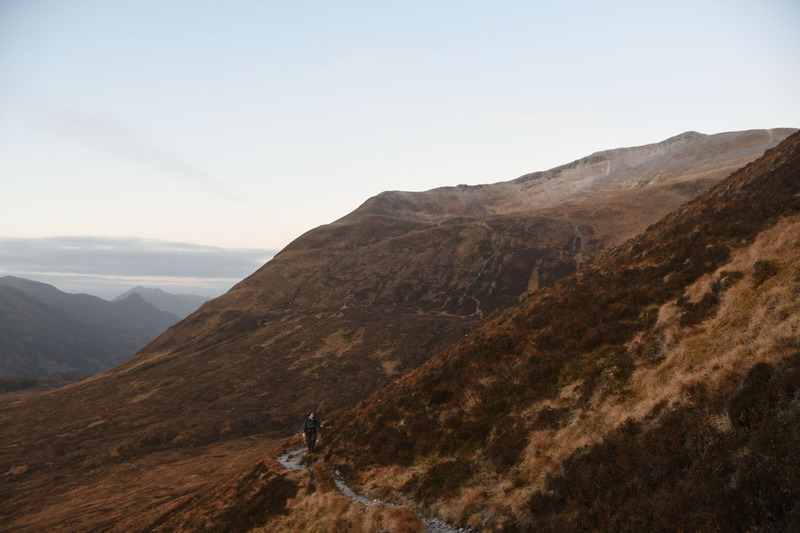 The approach to Na Gruagaichean narrows down to a wee arête – easy going though. We pondered dropping down the south ridge of Na Gruagaichean, but decided to cross to the other top and then use the stalkers path into Coire na Ba, something we hadn’t done before. The descent off the south top northwards is a little steep and eroded, we just took our time. 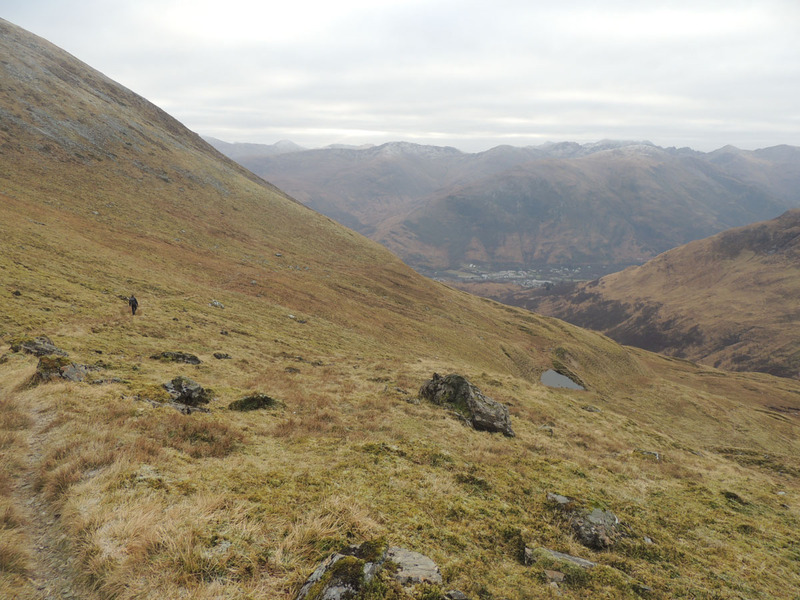 The descent from the north top towards Stob Coire a Chairn is rather more relaxed. 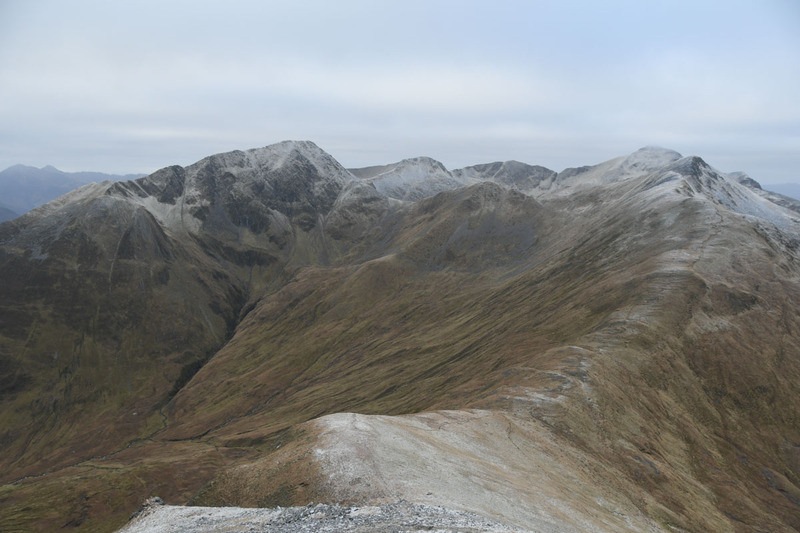 The stalkers path is marked on the 1:50000 map, dropping from NN 193 656 in a long zig zag into Coire na Ba. From here it was an easy amble down the path, lots of deer moving around in the coire to keep our attention. Back to the car before sunset. Good to revisit these hills, it’s been a while. The forecast sunshine would have been nice but ce la vie. 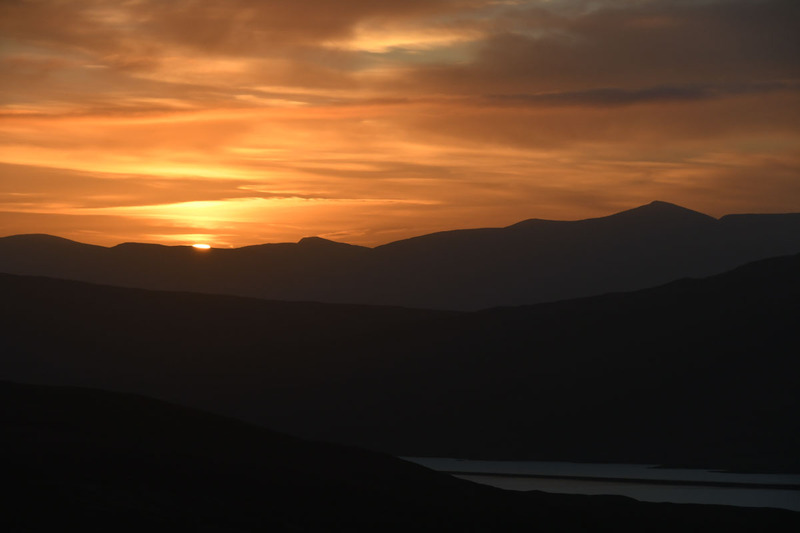 Stunning photos and excellent write up – thoroughly enjoyed reading about your day on hills we hope to do this year.